 Sol Lesser publicly announced on 4 January 1945 that he had managed to obtain the rights to film Tarzan pictures for the next 20 years and shooting on his next project, Tarzan and the Leopard Woman, commenced in July 1945. The Garden of Allah sets, originally built for a 1936 Marlene Dietrich film of that name, were used for the town of Zambesi while the Arboretum and RKO's own back-lot jungle were used for the outdoor footage. The film was completed by the end of the year and released the following February. 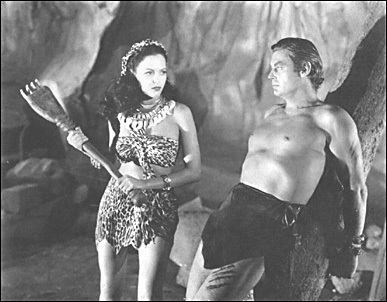 Tarzan's exotic nemesis (right) featured prominently in the intense publicity campaign Lesser mounted - ads appeared in about sixty magazines nation wide. 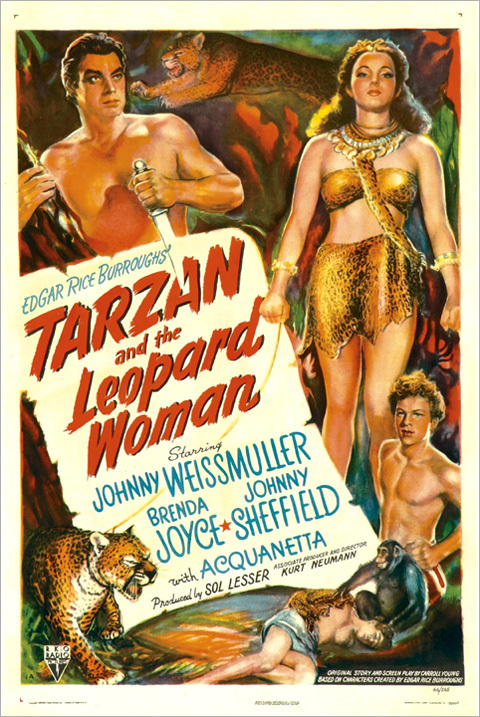 The publicity worked and the film was a runaway success being dubbed "sure fire box office" by Variety, who also claimed that "There isn't a dull moment in Tarzan and the Leopard Woman." (St Andrews) The actress chosen to play Lea, the High Priestess was a 24-year-old actress named Acquanetta, a smouldering and mysterious brunette that Universal studios dubbed "the Venezuelan Volcano". However, her real name was Mildred Davenport and she was from Wyoming, but of Arapaho descent (IMDb). Weissmuller Read the fascinating full story at Geoff St Andrews' Tarzan and the Leopard Woman page. • The ape cry was not used in this film, for the first time since the beginning of the sound era.  A murderous cult who worship a leopard god are intent on expelling the colonial administrators from the District. They are led by the cult's beautiful High Priestess, Lea, and her lover, Ameer, a disillusioned local doctor. The cult members, who wear leopard skins and claw their victims to death, begin attacking the caravans of the district to create an atmosphere of terror, but Tarzan realises that the attacks are not caused by leopards. However, he is ridiculed when he suggests to the authorities that the perpetrators are "like leopards, but not leopards." 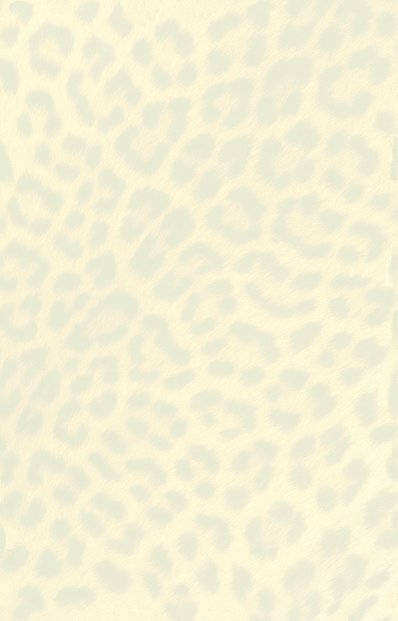 Lea's homicidal teenage brother, Kimba, insinuates his way into Tarzan's home in an attempt to prove he is a worthy member of the leopard cult by vowing to cut out Jane's heart. Before Kimba can realise his plan both Jane and Boy are captured when the Leopard Men attack their tree house. Tarzan is also captured when he attempts to defend four young female schoolteachers who the leopard cult want to sacrifice to their leopard god. 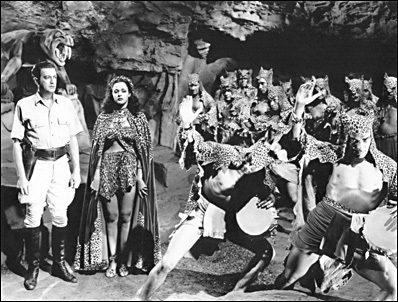 Cheta helps rescue the prisoners and Tarzan destroys the cult and it's leaders when he creates a landslide in their underground temple. The threat of the leapard cult has been eliminated. • Both photos are from A Pictorial History of the Tarzan Movies by Ray Lee & Vernell Coriell, 1966, Golden State News Co. Inc.